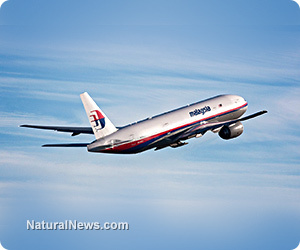 (NaturalNews) The "official" story of what happened to Malaysia Airlines Flight 370 is now a blatant cover-up. After an endless stream of wild incompetence from the Malaysian military and government concerning the radar signature of the missing flight, we are now told by the Malaysian government that the flight "went down over the southern Indian Ocean" and that all lives are lost. A Boeing 777 does not -- and cannot -- survive impact with the ocean and remain intact. It simply does not have the structural integrity to survive such an impact, which is a lot like hitting a cement wall at terminal velocity. If Flight 370 hit the ocean, it would have been broken into tens of thousands of pieces, many of which obviously float on water (such as the seat cushions) and would be witnessed washing up on regional shores or easily spotted by search teams. The lack of such debris is strong support that Flight 370 did not crash into the Indian Ocean as we are now being told. Remember the fact that the airplane was broadcasting data for at least 4 hours after the transponder was turned off? This fact is now suddenly being dumped from history and from our memories as if it never happened. We already know Flight 370 flew for 4 - 7 hours after diverging from its planned flight course. We already know this could have taken the plane to Afghanistan, Pakistan, Iran or even North Korea. (Click here to see my map showing possible destinations.) The fact that the plane broadcast this data for hours is not in dispute! Wall Street Journal: "U.S. investigators suspect that Malaysia Airlines 3786. Flight 370 stayed in the air for up to four hours past the time it reached its last confirmed location, according to two people familiar with the details, raising the possibility that the plane could have flown on for hundreds of additional miles under conditions that remain murky." The Guardian: "MH370: Missing plane could have kept flying four hours after disappearing, US investigators say... Engine data shows plane could have kept flying for four hours after disappearing"
Washington Post: " the plane may have flown for at least four hours after it dropped from civilian radar, U.S. officials said Thursday. A senior U.S. official said the information came from data sent via a satellite communications system by Malaysia Airlines Flight MH370. That data has convinced U.S. officials that the plane’s engines continued to run for at least four hours after all other communication was lost." So how does the Malaysian government now explain this? They don't. They simply gloss over this fact and hope we all forget it. They claim the plane went down in the Indian Ocean without flying very far at all. This makes no sense whatsoever and cannot be reconciled with the flight broadcast data received by Boeing. What is the Malaysian government's evidence that Flight 370 ended in the Indian Ocean and "all lives are lost?" They have no evidence. They have no bodies. They have no debris, no flight recorders, no sightings and no radar signatures that would put the aircraft in the Indian Ocean. They have zero evidence. So they are now floating a cover-up to try to put this issue to rest in order to distract from their own incompetence and their bizarre failure to track the radar signature of an aircraft flying well within the range of their radar. In fact, the only debris floating around right now is made of all the fragments of the Malaysian government's inept cover-up attempts that smack of a true "rookie attempt" to roll out a cover-up that's full of holes. If the pilot of Flight 370 was suicidal and wanted to fly the plane into the ocean, there would be no need to switch off the transponder before doing so. In fact, there would be no need to make all the complex, intentional flight maneuvers which Flight 370 clearly took as has been widely reported. The fact that the transponder was manually disconnected followed by the plane making deliberate maneuvers that put it on a new flight path is near-absolute proof that the persons controlling the aircraft had no intention of flying the plane into the ocean. It's also strong evidence that they did not want governments to track their new flight direction and destination. Without question, they intended to take the plane somewhere else and land it somewhere else, which is exactly why the aircraft continued broadcasting flight performance data to Boeing for 4-7 hours. The Malaysian government is now hoping you forget all these facts in believing their bizarre cover-up explanation. Flight 370 is now Malaysia's 9/11, complete with nonsense "official" stories and attempts to memory hole all the facts that originally came out in the mainstream media. We are soon going to be told outrageous lies like "Oh, Boeing never received any flight data broadcasts from the aircraft, didn't you know?" Anyone who now cites all the facts which have already been reported in support of the theory that Flight 370 continued on to another destination will be called "conspiracy theorists" and kooks. The mainstream media will start scrubbing stories and retroactively altering its reporting to match the "official" government story. We've seen this before. It's how governments and media outlets sweep 239 lives under the rug and try to discredit anyone who asks skeptical, scientifically-sound questions based on the actual evidence. In truth, the Malaysian government's bizarre new claim that Flight 370 "ended in the Indian Ocean" is the biggest conspiracy theory of all. It's sheer lunacy to reach such a conclusion without compelling evidence to support it, especially in light of all the other evidence that Flight 370 continued on for hours after the transponder was intentionally disabled. Based on the Malaysian government's obvious cover-up attempt (which is incredibly transparent and childish as far as cover-ups go), it now seems increasingly likely that the Flight 370 aircraft has, indeed, been delivered to a rogue nation where it is being transformed into a weapon. Malaysia has already proven that it is so incompetent that it cannot track huge aircraft flying across its airspace. This means a weaponized Boeing 777 is essentially a "stealth aircraft" to the Malaysian military -- a shocking revelation about military incompetence and lack of national security readiness in that nation. Apparently, this same Boeing 777 can also fly undetected across the airspace of other nations -- most likely by "shadowing" existing flights while turning off its own transponder. Whoever took control of Flight 370 now has a massive stealth weapon which an incredibly long flight range. This aircraft can now be outfitted with nuclear weapons and dispatched to almost any desirable target anywhere in the world, including cities like New York and Washington D.C., unfortunately. I was the first journalist in the world to suggest that Flight 370 had been captured and turned into a weapon. That same story was also the very first story to suggest Flight 370 passengers may still be alive. I still believe Flight 370 passengers may have survived the flight and the landing at the new destination, but now that world governments are rolling out their "official" stories, there is no question in my mind that they will do anything to support those official stories, even if it means discarding the lives of all the passengers. Sadly, I am now forced to recalculate the odds of Flight 370 passengers being found alive at no better than 1 in 5. (It was previously as high as 1 in 2.) But it is not zero! There is a realistic chance the passengers are being kept alive as some sort of international bargaining chip. You can now expect the governments and media outlets of the world to start scrubbing their archived stories and statements, altering the "news history" to fit this new Malaysian government cover-up. I wouldn't even put it past these people to now secretly sink some aircraft debris in the Indian Ocean so they can "find it" and thereby complete the cover-up. If there's one thing I've learned in all my years as an award-winning investigative journalist, it's that you should never trust official stories... especially when they contradict all the earlier evidence.